SUBHEAD: Many prominent environmental activists concerned with climate change have too many children. 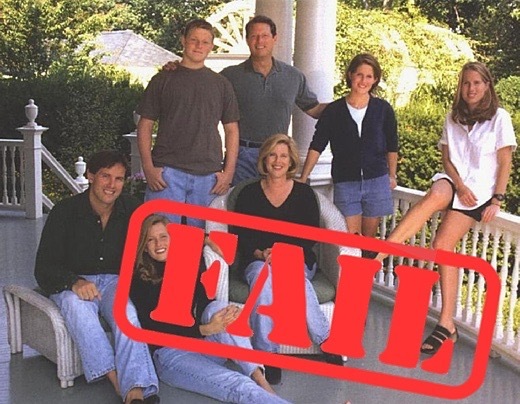 Image above: Al Gore and wife Tipper, center and their surrounding spawn of five on the porch of their 20 room Tennessee mansion. From (https://thedarjeelingexpress.wordpress.com/2011/06/29/goracle-babies-for-me-but-not-for-thee/). percent of all humans who have ever lived are alive today. Recent projections of fertility momentum put global population between 9.6 and 12.3 billion by the end of the century. Of course that could no more be sustained than too many reindeer living on lichen on a small island. Many of the findings highlight the strength of this demographic momentum. For example, the study found that if every unplanned pregnancy were avoided worldwide due to reproductive education, family planning, and cultural shifts, population would peak at 8.39 billion in 2050 and then fall to 7.3 billion by 2100, a level slightly higher than today. The study also found that implementing contentious population control measures such as a worldwide one-child policy, results in a population that wouldn’t fall back to present-day size until the end of the century. Another scenario looked at a hypothetical catastrophic mortality event equal to the number of deaths from the First World War, the Second World War, and the 1918 Spanish flu epidemic combined. This event barely altered the long-term population projection. Population tends to be the third rail for many environmental activists. They are okay talking about a one child policy for China, or lamenting the fact that Africa will more than triple its population by mid-century, but the idea of limiting their own family size seems to hold little interest. Perhaps some role models are needed. Among the presidential candidates, Jill Stein gets a C. She has two children. Donald Trump receives a failing grade. He has 5. Hillary Clinton, with only one child, receives a B. To get an A she would have needed either none or a half child, perhaps one adopted from a one child family or acquired by marriage. Leo DiCaprio (0); Rocky Mountain Institute’s Amory Lovins (0); Consumer Advocate Ralph Nader (0); Sea Shepherd Captain Paul Watson (1); 350.org’s Bill McKibben (1); Greenpeace Executive Director Annie Leonard (1); Greenpeace spokesman Kumi Naidoo (1); and “population bomb” theorists Paul and Anne Ehrlich (1). The Global Population and Environment Program believes that healthy people and a healthy environment go hand in hand. We work to protect the global environment, preserve natural resources for future generations, and ensure healthy, thriving families and communities by promoting global reproductive health, reproductive rights and sustainable development initiatives. Pope Francis has yet to issue an encyclical urging Catholics to use birth control. Naomi Klein thinks artificial insemination should be a universal right. Ralph Borsodi, George Monbiot, Wendell Berry, David Attenborough and Jane Goodall. Rachel Carson (0); Henry David Thoreau (0). Thomas Malthus (3), Helen Caldicott (3); Al Gore (4); David Brower (4), Jacques-Yves Cousteau (4); Garrett Hardin (4); Allan Yeomans (5); Aldo Leopold (5); and David Suzuki (5 children, 6 grandchildren).